Notification. Selection for these RBI Assistant vacancies will be based on prelims and mains examination. Starting date of Online registration process is 18-October-2017. Closing date of online registration process is 10-November-2017. Payment of Exam fee Online 18-10-2017 to 10-11-2017. Online preliminary test will be conducted for this RBI Assistant Jobs recruitment as on 27th, 28th November, 2017. Online Main test will be on 20-December-2017. 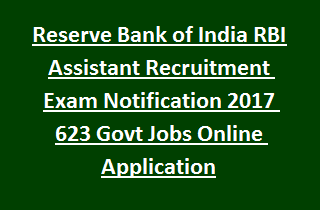 All details of Reserve Bank of India RBI Assistant Recruitment Exam Notification 2017 623 Govt Jobs is mentioned below. As per Notification of RBI Reserve Bank of India, total no. of Assistant posts are 623. Bachelor’s Degree in relevant discipline with 50% of aggregate marks from a recognized institute. Age limit must in between 20 years to 28 years as on 01-10-2017. Five years relaxation is there for SC, ST; 3 Years for Other Backward Classes, 10 years for PWDs. Rs.14650/- per month for Assistant Jobs. 1. It will be through Preliminary test and Mains exam followed by an Interview. 2. Preliminary test has 100 questions for 100 marks with 1 hour time duration. Questions will be asked from English Language, Numerical Ability and Reasoning Ability. 3. Main exam has 200 questions for 200 marks with 2 hours time duration. Questions will be asked from Test of Reasoning, Test of Numerical Ability, Test of General Awareness, Test of English Language and Test of Computer Knowledge. This Main exam will be available bilingually i.e. English and Hindi. 4. Aspirants will have to qualify in each of tests of the online exams. 5. There is a negative marking for each wrong answer in both preliminary and Main exams. 1/4th marks will be deducted. 6. Interview is for 35 marks. 7. Preliminary and Main exams will be held in venues across many centers in India. 8. Online preliminary test will be on 27th, 28th November, 2017. Online Main test will be on 20-Dec-2017. Preliminary Exam Duration is one hour. For Mains exam each topic contains a specific time. It means candidates have to finsh particular topic in that given time only. Rs.50/- for SC/ST/PWD/Ex-Serviceman category candidates; Rs.450/- for OBC/General category candidates. Payment of fee Online is from 18-10-2017 to 10-November-2017. Application forms will be accepted only through Online mode using RBI Reserve Bank of India website www.rbi.org.in Before applying Online, aspirants must ensure that they fulfill the eligibility conditions for the Assistant Jobs. Closing date of Online registration process is 10-November-2017.